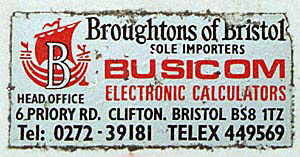 Broughton and Co. (Bristol) Ltd. ("Broughtons of Bristol") was incorporated in 1950 by Mr. A.A.R. Broughton. The first offices were on St. Michael's Hill Bristol, England, shortly moving to No 1. Berkley Square, then to Priory Road Clifton, Bristol. The company's principle activities are the sale, supply and maintenance of office/business machines. For many years after its founding the company was the sole importer and distributor in Britain of most of the main East German manufactured office machines. The products covered being typewriters, mechanical calculators, book-keeping and invoicing machines, under the brand names Rheinmetal, Supermetal, Soemtron and Mercedes. These products were purchased through barter trade. It was during this formative period that a strong market was developed in the educational field, in particular the sales and marketing of Rotary/Barrel calculators used for the teaching and reinforcing of basic mathematics across all levels of academic strata. The machines sold were a Czechoslovakia calculator under the brand name of Triumphator, a Spanish machine Minerva, and a Chinese machine branded the Flying Fish. Very quickly the Spanish machine became the main seller, low cost being the reason. Announcement in 1966 about the Chinese-made Flying Fish calculator. At this time the company was dealt a major blow by the Spanish manufacturer breaking contracts and supplying the whole of the production of the calculator to Olympia of West Germany. Fate now played its hand. A travel agent friend who had just come back from Japan had a magazine in Japanese. In the magazine was a picture of the Nippon HL-21 hand calculator, manufactured by the Japanese Nippon Calculating Machine Corporation. Cutting a long story short, the company started to import this product to the UK with great success. The Sumlock Anita (the very first electronic desktop calculator) was now being produced and despite the high cost was hitting the traditional market very hard. It was at this time that Nippon Calculating Machine Corporation produced its first copy of the Italian IME electronic calculator. The first to use transistors and ferrite core memory. From then Broughtons grew strongly, with a U.S. subsidiary, Broughtons Calculators (U.S.A.) Ltd., at 56 Beaver Street, New York. The HL-21 hand calculator achieved the largest single order in the U.K., being 500 units in one go to Fife Regional Council. With its venture into electronics Nippon Calculating Machine Corp changed its name to Business Computer Corporation, known as Busicom Corp . In 1968 a joint venture company was set up in the U.S.A. between Broughton & Co. and Busicom Japan to market the now very successful and profitable HL-21 hand calculator into the U.S.A. educational market. There now followed five remarkable years for all concerned. Busicom was at the leading edge of electronic calculator development and produced a range of calculators leading up to the production of the world's first microprocessor with Intel Corp, the Intel 4004, and its first use in a machine of any sort, the Busicom 141-PF calculator. Next came the very first single chip calculators developed by Busicom in conjunction with Mostek U.S.A. [this would be in 1971 and the calculators were the Busicom Junior/NCR 18-16 desktop model and the Busicom LE-120A, one of the first pocket calculators and the first with LED display. A Busicom Junior calculator, here re-branded for sale by National Cash Register, which was the first single-chip calculator. 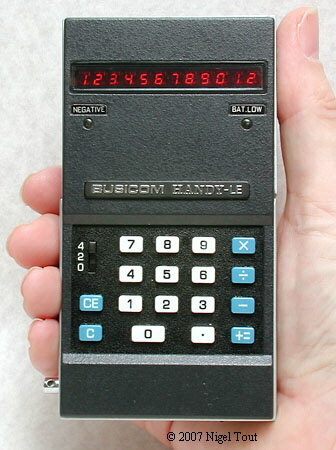 Busicom LE-120A "HANDY", the first truly pocket-sized calculator, the first single-chip hand-held calculator, and the first calculator with an LED display. This was quickly followed by the very first use of Liquid Crystal from R.C.A. Corporation U.S.A. for a calculator display and development of the electronics to run the Liquid Crystal Display (LCD). At this time the packaging of the LCD was not up to scratch and although the machine worked it was not sold. During this exciting period of time both the U.K. and U.S.A. Broughtons companies prospered. Although Busicom was one of the most technically innovative calculator manufacturers its business acumen was not as good. A recession was now hitting Japan and in early 1974 Busicom became the first major Japanese company in the calculator industry to fail. This failure very badly hit both the U.S. and British operations of Broughton. The U.S. company having been highly successful suddenly found itself without any product, though the UK company had already been purchasing product on a short term basis from Hong Kong. It was at this time that the companies rationalised and looked for new product from more than one source. After the failure of Busicom Japan, Broughton & Co bought the trade name Busicom for the UK from the Japanese, and started to use the name Busicom Business Machines . Calculators from various manufacturers were re-badged with the Busicom name. In 1975 Broughtons was approached by Y. Nakano, a Japanese who had worked for Busicom USA on the west coast, offering computer supplies. They asked if he had any good calculators? He had, and from now on they bought very high quality calculators from his company Nasco Corp. The calculators were made to their specification by Towa Corp and Shinwa Digital. Now for quite a period of time they enjoyed a steady profitable growth. 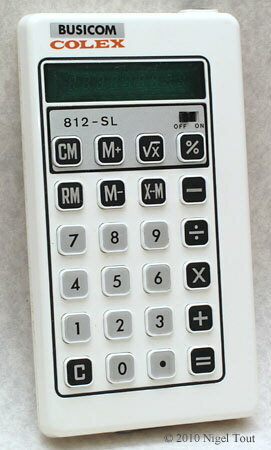 Examples of later calculators, after the collapse of the original Japanese Busicom company. These were made by other manufacturers and badged "Busicom" for Broughtons. 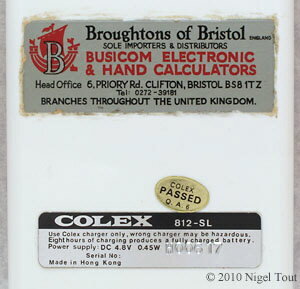 This is a Colex 812-SL calculator, made in Hong Kong. It simply has a Busicom label stuck on for distribution by Broughtons of Bristol, in the UK. In 1979 they started to sell cash registers, calculators in cash register housing. Because of the hard lesson of Busicom (all eggs in one basket) it was decided to source products from more than one supplier. The diversification of suppliers led them to buying calculators from Hong Kong, Singapore, Taiwan, Japan, USA and now mainland China. The company, now over 50 years old, specialises in supplying cash registers customised to special requirements to various countries. However, it has also expanded into supplying mail-order companies and large distributors with either Busicom/Bistec product or branded to the customer's requirements. For example, it has supplied all of W.H.Smith's Niceday brand calculators, Lloyds Bank, National Westminster Bank, H.M.S.O. (the British government's printing house), all of the British Ministry of Defence's calculators, plus many more major accounts. It has recently moved to Whitchurch, near Bristol, England. Copyright © 2000 Peter Broughton/Nigel Tout. Click here for more details and photographs of Busicom calculators on the associated British Vintage Calculators site.